See, there was a method to the Accidental Locavore’s madness: six blog posts and six recipes for a total of twelve posts to round-up 2012. Here are the top recipes from 2012, including the most posted on Pinterest. Not surprising, the most popular were also seasonal, so you might have to wait a bit to try some of them. They’re all easy and quick, too. What’s your favorite or what will you resolve to try in 2013? Recipe for Chive Blossom Vinegar: Something I had forgotten all about, chive blossom vinegar. A great way to use up all those flowers in a beautiful, tasty vinegar. Recipe for Garlic Scape Pesto: A friend gave me a huge bundle of garlic scapes and this pesto, while definitely strong enough to keep vampires away, is wonderful on lamb and fish as well as pasta. 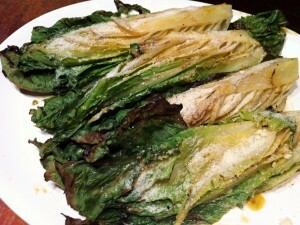 Grilled Caesar Salad: Not only was this the best thing we ate on that particular weekend, this quickly became our go-to salad over the summer. It’s a delicious twist on an old favorite. Recipe for My Green Tomatillo Salsa: This is my favorite salsa recipe. In the winter, when good-tasting tomatoes are impossible to find, tomatillos are a much better alternative for a fresh salsa. And, when you make it yourself, you can make it as hot (or not) as you’d like. Recipe for Coconut Macaroons, Easy and Delicious: Warning: these are addictive! If you really want to go all out, melt some good dark chocolate and dip them in. Don’t say you weren’t warned! 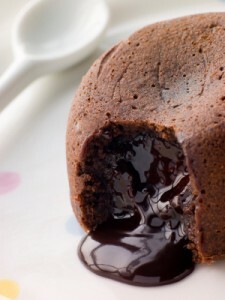 Recipe for Warm Melting Chocolate Cakes: This is by far the most pinned and re-pinned photo on Pinterest. It’s fascinating because it has taken on a life of its own and gets re-pinned almost every day. It also happens to be a terrific dessert! That and the macaroons are my two go-to desserts. 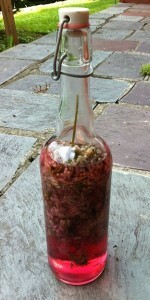 about chive blossom vinegar: it’s great fun to give away, esp. when you’re off to a friend’s for dinner. if you’re lucky enough to have a lusty plant in your garden, keep your eyes out for the odd or beautiful bottle laying about, and stash it away for the summer.